We got this documentary in the mail today, Starbucking, and watched it tonight. Essentially, it chronicles the journey of a guy named "Winter" as he travels around the country (but he has also traveled internationally) to drink a 4 oz. cup of coffee from every corporate-owned Starbucks, ever. When he made this his goal, he forgot to consider that Starbucks is a growing company; hence, his quest will never end. On his website, Winter lists pictures and dates of every Starbucks he has visited. 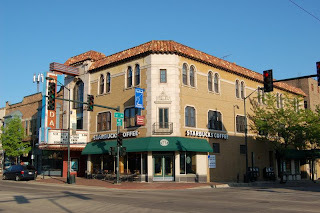 Here's one of the Starbucks in my hometown, St.Charles, IL, taken on May 12, 2007. Doc, you really have to stop posting so much. This is getting ridiculous. Why are you writing so much about coffee? Let's start a conversation about ice cream. We had some ice cream last night: Sonic Blasts. Eat your heart out.